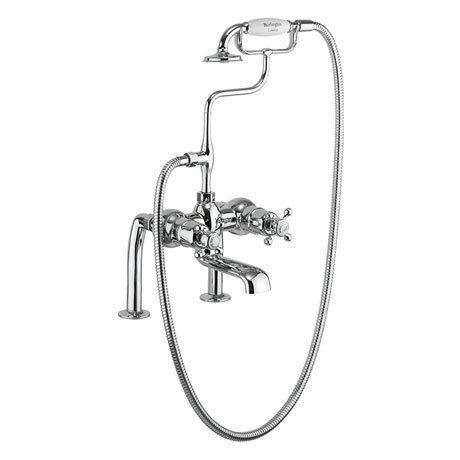 The Tay Deck Mounted Thermostatic Bath Shower Mixer adds elegance to any traditional bathroom. Manufactured from high grade brass and finished beautifully in chrome. The tap is fully thermostatic with two outlet twin control with an independent flow divertor and temperature controls and features a swivel spout. Comes complete with an S connector and bracket, 1500mm shower hose, and handset with ceramic handle. Supplied with Claremont handles as standard. Anglesey or Birkenhead handles are available as an alternative option.